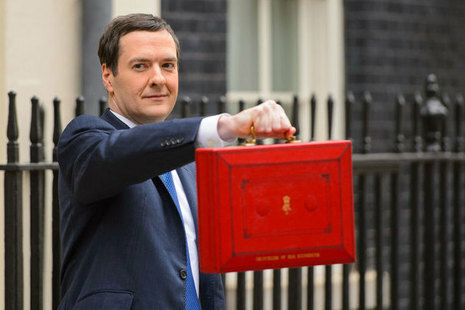 The Chancellor of the Exchequer, George Osborne, today delivered his final Budget statement ahead of the General Election in May. The UK economy grew by 2.6% in 2014, with growth forecast at 2.5% for the year ahead. In addition, employment has reached record levels, trade deficit figures were described as “the best for 15 years” and living standards were reportedly higher than in May 2010, according to the Office for Budget Responsibility (OBR). Inflation was projected to fall to 0.2% in 2015. The deficit has been halved since 2010 as a share of national income, with borrowing set to fall to £90.2billion in 2014-15 and further to £75.3billion in 2015-16. Plans to cut £13billion from government departments and £12billion from welfare spending. The pension pot lifetime allowance will be reduced from £1.25million to £1million from next year. The law will be changed to allow pensioners to access their annuities, with the 55% tax charge abolished and tax applied at the marginal rate. An additional investment of £25million to support army veterans was also announced. Beer duty will be cut by 1p, cider and whisky by 2p, and wine duty will be frozen. Tobacco duty remains unchanged. A planned increase for petrol duty in September has been scrapped. The personal tax-free allowance will rise to £10,900 in 2015-16 and again to £11,000 in 2016-17. The 40p tax threshold will also rise above inflation, from £42,385 to £43,300. Also on personal taxation, annual paper tax returns will be abolished and a review of inheritance tax avoidance through deeds of variation will take place. A new personal savings allowance – with the first £1,000 interest becoming tax free – and the annual savings limit for ISAs increasing to £15,240. A tax on diverted profits, to tackle multinational profits being “artificially moved offshore”, will be launched next month. The annual bank levy rises to 0.21%. The supplementary charge on North Sea oil producers will be cut from 30% to 20% and a new tax allowance will encourage investment. Negotiations on City Deals for Aberdeen and Inverness will continue. The UK Government will consult on reducing electricity distribution costs for consumers in the North of Scotland. It will also work with the Scottish Coal Task Force and industry stakeholders to explore alternative options for addressing the environmental liabilities associated with unrestored opencast mines in Scotland. Scottish air ambulance services will benefit from a share of £10m of national funding.